Algerian-born artist Houria Niati sees her work as 'a visual explosion of the mind, an interaction of ideas in space and time'. It is often accompanied not only by her own prose but also live performances of Arab-Andalusian songs in an attempt to bring the past, present and future into one coherent whole. And it is work that is increasingly recognised on a global stage. 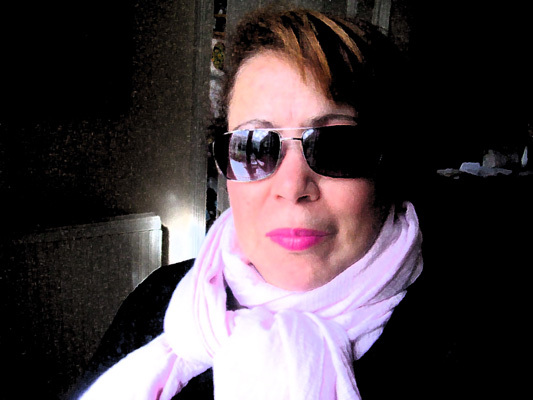 Houria specialised in community arts in Algeria before arriving in London in 1977 where she studied drawing and printmaking at Camden Art Centre and Fine Art at Croydon College of Art and Design. She then went on to gain an MA in Fine Arts at the Middlesex University. Her work, mainly in oil paintings and pastels, reflects her rich inherited background and her struggle to come to terms with the dichotomy between eastern and western identities. Her cultural background consists of strong Arab-Muslim influences from her family and her experiences growing during the French occupation. She attended French schools in Algeria and she was only 6 years old when she witnessed the first bomb that marked the beginning of the 7 years war against French occupation. Her experiences during the war will make a deep impact in Houria's work. Her paintings and multimedia installations therefore have a truly international feel as they bring all the influences together: Afro-Algerian myths and legends, French Romanticism and Surrealism, European Post-Impressionism and Expressionism. Since her stay in UK she developed a strong awareness of the International Avant-Garde Movement. Houria began to exhibit her work in 1983 in London: her work has been shown in many touring exhibitions including UK and USA. She is recognised as one of the most important Artists emerging from North Africa and probably was the first new-contemporary Algerian Woman Artist who ever exhibited in UK. In 'No To Torture', the most powerful installation of 5 paintings based on Delacroix Women of Algiers is the work that combine strong message and high art. Produced in 1982-83 in London, this work epitomises Houria's strong will to commit her art for a better world, for humanity. Her most recent work, an installation untitled 'The Curtains of Words' based on childhood and family photos, is idiosyncratic and expresses the issues of the artist who chose to emigrate to London since 1977. The words of the poems written by the Artist, are the curtains which are digitally printed on the photos. It is a kind of positive ritual that comes from a deep desire to renew with the past and to build up new ties. Those words, expressed in three languages, represent the multi-culture but also the intensive need to communicate with the homeland that is changing so much. The family photos taken by the artist during her visits to Algeria, are the witnesses of her observation: the words are the silent commentaries on the events and changes that took place during her thirty years of emigration.